Antoine-Jean Saint-Martin was a pioneer of Armenian Studies in Europe at the beginning of the nineteenth century. He was born in Paris on January 17, 1791 in the family of a prosperous merchant. He attended the Collège des Quatre-Nations, with the intention of entering commerce. However, his intellectual interests led him to a different field. At the age of twenty, he already mastered Armenian and Arabic. He would also learn by himself Persian, Syriac, and Turkish, as well as the basics of several other languages, such as Zend (the language of the Persian sacred books) and Georgian. In 1818-1819 Saint-Martin published his masterwork, the two-volume Mémoires historiques et géographiques sur l’Arménie. This collection of studies and translations, which was quite influential in Armenian scholarship throughout the nineteenth century, had been completed in 1811, according to the author. It was reviewed very favorably, and on September 2, 1820, he was elected a member of the Académie des Inscriptions et Belles-lettres, a branch of the prestigious Institut de France. He later entered the Ministry of Foreign Affairs as a consultant. In 1822 he was among the founders of the famous Société Asiatique, and directed the publication of its journal, the Journal Asiatique. In 1824 he was appointed director of the Bibliothèque de l’Arsenal. Among other works, in 1825 he published the Armenian text and the French translation of the fables of Vartan Aykegtsi, a work of the thirteenth century, and in 1827, the translation of the chronicle of Mardiros Erznkatsi, a bishop who traveled to Spain in the fifteenth century. 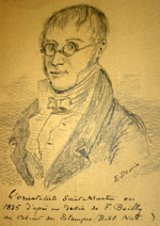 Based on the text of Movses Khorenatsi in his History of Armenia about the cuneiform inscriptions left by the mythical queen Semiramis in Van, he induced the French government to send German young scholar Friedrich Eduard Schulz to the Lake Van region in 1827. A year later, he published Schulz’s first report on the remains of the hitherto unknown civilization of Urartu. Saint-Martin passed away on July 17, 1832, at the age of 41, victim of the second pandemic of cholera in Paris. His translation of the History of Armenia by Catholicos Hovhannes Draskhanakerttsi was posthumously published in 1841.